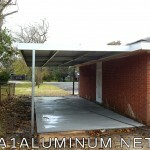 We took down the existing carport and installed a new 7’8″x55’6″ Aluminum carport and/or patio cover with a 12″x3″ Riser pan. You can see we connected it to his other carport. 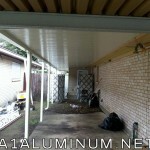 Customer was very happy and said he has more work for us. 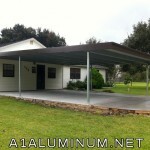 We actually did 2 steel awnings for the Church but only got pictures of the carport. 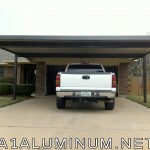 The carport was a 12’x32′ and the other awning was a 9’x11′. 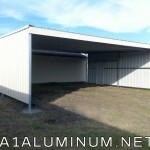 Steel Carport in Alvin, Texas by A-1 Aluminum Co.
Steel Carport in Alvin. It’s a big one!